"The Alien" vs. "Superman" Coming Soon to a Theatre Near You? By Paul “Paparazzi“ Jones & Justin Jones – In the aftermath of Hopkins vs. Shumenov, Bernard “The Alien” Hopkins(55-6-2, 32 KOs) wasted little time in ditching his boxing gloves for his promotional hat to campaign for a showdown with Superman. That is, WBC Light Heavyweight Champion Adonis “Superman” Stevenson (23-1, 20 KOs). 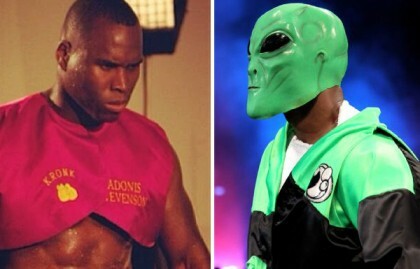 “The Alien vs. Superman” sounds like a snazzy title for a forthcoming DC Universe original movie, but the potential matchup between two of boxing’s elite is a match-up that many boxing fans would pay to see. “Stevenson, I’m coming to Canada. I’m getting my papers together,” said Hopkins. A bout at the Bell Centre in Montreal, Quebec (CAN) makes logical and economic sense. Hopkins decisioned Jean Pascal (29-2-1, 17 KOs) there in 2011 to win the WBC Light Heavyweight title and the duo set an attendance record (17,750) in the process, according to Chris LaBate’s report on boxingscene.com. Stevenson has fought at the Bell Centre many times and developed a loyal following. More important, with the disintegration of the highly anticipated Stevensonvs.Sergey “Krusher” Kovalev (WBO; 24-0-1, 22 KOs) match-up, and Stevenson’s signing with influential advisor Al Haymon, a Light Heavyweight unification bout between “The Alien” and “Superman” is the likely consolation prize for boxing fans assuming that Stevenson defeats Andrzej Fonfara (25-2, 15 KOs) in May. Stevenson is a formidable champion who has won 10 fights in a row since being TKO’d by unheralded Darnell Boone (TKO 2) in 2010. These victories include a knockout of the aforesaid Boone and signature wins over Chad Dawson (31-3, 17 KOs) and Tavoris Cloud (24-2, 19 KOs). Superman also boasts an 83% KO ratio and was given high marks in 2012 by the late Hall of Fame trainer Emanuel Steward. The fact that Stevenson is a champion known for his power makes this fight even more enticing to Bhops. Based on Hopkins’ performance against Shumenov, it would be a mistake to discount the uncanny ability of The Alien, even when pitted against Superman. It is doubtful, however, that Mayweather Jr. would agree to the fight and/or a weight limit above 160 pounds. Equally doubtful is that Hopkins would square off against WBO titlist Sergey Kovalev, who is promoted by Main Events and fights on HBO, even if he were to defeat Stevenson and become the lineal champ at Light Heavyweight. Paul “Paparazzi” Jones and Justin Jones of Eastside Boxing, both had the fight 117 – 110 in favor of Hopkins. Hopkins-Shumenov: Fighter, Media, and Fan Predictions! You are here: Home / Boxing News / “The Alien” vs. “Superman” Coming Soon to a Theatre Near You?